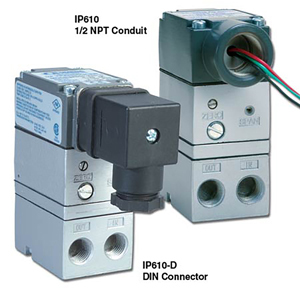 The IP610 is an electronic pressure regulator that converts a variable 4 to 20 mA signal to a proportional pneumatic output. Its compact housing, accessible ports and easy adjustments provide an ideal answer to applications that are space-constrained. This economical instrument provides precision air pressure regulation to actuators, valves, positioners and other final control elements. An integral volume booster provides high flow capacity, increasing control speed in critical applications. Multiple choices for wiring and porting simplify installation and decrease the time required to do so. In addition to standard wall, panel or pipe mounting, an optional DIN rail mounting kit is available. Note: All IP610's come with mounting bracket and complete operators manual.